I think I've said this before, but when the BatPhone rings, the info we get is sometimes ambiguous; it might be something, or it might be nothing. 'Stabbed in the face' feels more visceral, more serious. Maybe because there's not so much soft tissue that's safe to stab; 'slashed across the face' might look more gory, but, somehow doesn't convey quite the same feel to me. That having said, if you've been stabbed in the face, there are a variety of 'safe' places the blade could go, all of which are going to ruin your day, and your movie star looks, but none of which will ruin everyone else's day. There are, of course, an equally large number of places that blade can slide which will change your whole outlook on life. Phineas Gage demonstrated that rather admirably, albeit unintentionally. The whole 'science' of lobotomy / leucotomy was based on this. So, the warning call of 'stabbed in the face' is alive with promise, with danger, with fear and uncertainty; only when they roll in do you know. I'm guessing you can see the problem... the horizontal line is a monitoring lead, the (roughly) vertical line is all knife. Through the eye or around it? And I'm no expert but, did that make it into the anterior cranial fossa?! 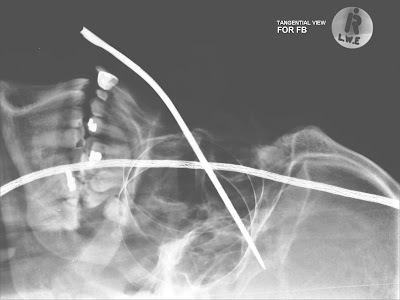 Is it not a bit inconvenient to leave a monitoring wire in the X-Ray view? Or was it a case of "Hmm, that knife could be poking in to squishy brain matter, maybe we'd better get a head film to check.... like, right now. I need a radiographer stat!" Except without the ER style language, obviously. don't forget to provide a referral to the dentist!